Here’s a list of some of the most popular chain locks available today. You can order by weight, length and security rating. I find the weights difficult to imagine so I have added a “number of cans of coke” weight to make it a bit easier! You can also filter which locks are shown by using the search field. For example if you just want to see Sold Secure Silver rated locks, enter “Silver” into the search field. There’s a similar table that compares U-locks here. 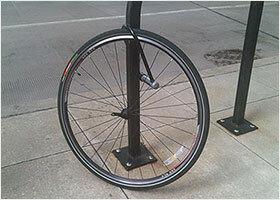 If you’re still unsure about what type of lock you need, check out my bike lock buying guide. And if you need more specific recommendations, read our chain lock buying guide. Most of the information comes from the websites of the brands themselves. However, the weights of the OnGuard locks are not provided on their website, so I had to hunt around a bit and they may not be 100% accurate. If you see any mistakes please let me know and I will correct them! Nice site, lots covered. Thanks. I believe the kryptonite 785 integrated chain is in fact a silver rated chain at soldsecure.com. Just felt I should pass that on for an edit. Thanks Cam! I can’t find anything about the Kryptonite 785 on the Sold Secure website. And it’s not listed as rated on the Kryptonite website. Are you sure it’s Silver? Yes you’re right! They received a whole load of new ratings in June 2016. I need to update my listings! The abus ionus 6800 looks like a nice chain also, perhaps that could be covered. It’s only around 750g, and in my country, is only about $20 more than the before mentioned kryptonite 785 chain. Yes I need to add them! I think they’re pretty good as chains go. HipLok Gold is 10 mm and Sold Secure Gold. Hiplok v1.50 is 8 mm and Sold Secure Silver. I would say the v1.50 chain is too thin to offer enough protection personally. It’s too easily defeated by bolt cutters. The Gold chain will be more difficult to beat (but still possible) and if you’re risk level is reasonably low you should be OK with this one. Thank you for the information. I recently (and unfortunately) got my bike stolen, and I’m looking for a new lock that was portable and secure. I’m deciding between the hiplok gold or the Abus bordo granit X plus 6500. Which one would you recommend most? I would say the Bordo. Why? I think it’s probably a little bit more secure. And it’s easier to carry than the Hiplok. I’m not a big fan of carrying a chain round my waist. It’s likely to be dirty and it might even be dangerous in an accident. Bear in mind though that both these locks, although Sold Secure Gold, are at the bottom end of that rating. For example, the Bordo is the only Gold rated lock with only 2 stars from ART. And the Hiplok, (like all 10 mm chains) can be cropped by bolt cutters under certain circumstances. That’s not to say you shouldn’t buy either of them. They’re both pretty secure. Just not top level. Have a good think about your risk level using my guide. As long as you’re not “Higher risk” for all 3 answers, you should be OK.
How do the smaller Abus 7mm chain locks rate? The Abus U-locks and thicker chain locks are always out of stock and the local distributor keeps recommending the 7mm (in-house scores of 7/15 and 8/15)… Are they still a much better alternative to a cable lock, or are they roughly the same? I think 7 mm is a bit thin to be honest. The 7 mm Abus chains are still better than a cable lock. In this video for example you can see someone struggling to crop a 6 mm Abus chain with bolt cutters. But these chains certainly can be cut by bolt cutters if the thief knows what they’re doing and can get the chain in a favorable position. My advice would be to get a thicker chain (Sold Secure Silver or above) from another source. Abus Iven and Hiplok v1.50 are 8 mm Sold Secure Silver chains. But whether you use a 7, 8 or 9 mm chain make sure you keep it as far from the ground as possible. In fact I would only use chain like this wrapped very tightly around the top tube. So you use something else to secure the wheels. This way even a 7 mm chain might be strong enough to protect your bike as it would be so far from the ground it would very difficult to crop. ART is a Dutch lock testing organization. They rate locks from 1 to 5 stars according to how secure they are. They tend to be a bit more demanding than Sold Secure. 2/5 stars is roughly equivalent to Sold Secure Silver. 3/5 stars is more like Sold Secure Gold. How would you rate a Beeway Heavy Duty Anti Theft Chain linked Motorcycle lock with combination? They are second best sellers on Amazon. Combination chains locks like this are really easy to pick. I doesn’t say how thick the chain links are, but at 750 g there going to be really thin. There is no way this is “Heavy Duty”. And for $16 I wouldn’t expect i to be. I would advise you to steer well clear! What about muddy fox chain locks? So pleased that you created this source of lock knowledge. After reading I bought an Abus Granit CityChain X-Plus 1060/85 for my BMX. The lock is great. However, my son has a BMX and needs a good chain. My 85 cm is too heavy for a six year old, but he needs something at least Solid Secure Gold rated. I cannot really find a good 55-65cm long ABUS chain: Do you know of one? I don’t think Abus do shorter high security chains. The Kryptonite Evolution series 4 1055 Mini would be a good choice here though. I was thinking of using this for securing a front wheel. I already have a ABUS Granit 1060/85cm chain for the back wheel/frame. How long for a medium bolt cutter to get through this? Just for protecting the front wheel this might be OK, depending on your circumstances. But a medium bolt cutter would go through it very quicklu / easily. Have you thought about using a small u-lock instead? I had considered the U-lock, but I find those quite fiddly. I may go for a 9mm chain instead if I can find a good ABUS in a 55/70mm version. I’m not too sure about the Kryptonite locks any more. Ref me last post before this. How reliastic is this video of picking a disc lock on a “Kryptonite Keeper 755 Mini Integrated Chain” in approx 20 seconds. I nearly bought this chain today to use to lock my front wheel, but doubt I shall. How do the Krpytonite locks stack up against the ABUS locks? Or are the locks in the Kryptonite KryptoLok series 2 955 better than the Kryptonite Keeper 755 Mini chains? Lock picking is not commonly used by bike thieves Sophie. Especially if the lock is only protecting your wheel. Unless it’s a really expensive wheel! However the Kryptonite Keeper 755 Mini isn’t a very strong lock. The Kryptonite KryptoLok Series 2 955 is definitely more secure but it will also be heavier. I’d say if you’re only using it to protect your wheel, unless it’s a really expensive wheel then the Keeper will be sufficient. You need a much better lock for your frame though.